Preheat the oven to 400°F. Cut off the tough ends from the asparagus spears and toss with olive oil, salt and pepper. Arrange the spears on a baking rack placed on top of a sheet pan, and place in the oven to roast for 10 minutes. Roasting time may vary depending on the size of the asparagus, so check for tenderness with the tip of a paring knife. With a box grater or a food processer, grate the potatoes and season with salt and pepper. Bring a medium-sized sauté pan to high heat and add two tablespoons of grapeseed oil. Add the grated potatoes to the pan, forming an even layer. Bring the heat down to medium and push in the sides to form a nice, round potato rösti. Add more oil if potato is sticking. Using your spatula, loosen the potato rösti from pan. Flip and cook for three more minutes and finish by placing it in the oven at 350°F for 10 minutes. Season the steaks with salt and generous amounts of cracked pepper. Bring a heavy, large sauté pan to high heat and add grapeseed oil. Place the steaks on the pan and cook to a desired degree of doneness, about five minutes per side for medium rare. Transfer the steaks to a plate, and keep warm. Turn off the heat under the sauté pan. Add brandy to the pan and ignite carefully with a stick lighter. The brandy will flame instantly, so keep a safe distance from the pan. However, alcohol burns very quickly so the flame should last just a few seconds. Turn the heat back on and bring the brandy to a boil, scraping up any browned bits. Add the cream and green peppercorns, and boil the mixture until it is reduced to a sauce- like consistency. This should take about two minutes. Whisk in the Dijon mustard, with salt if necessary, and set aside. Remove the rösti from the pan, sliding it onto a cutting board, and cut it into wedges. 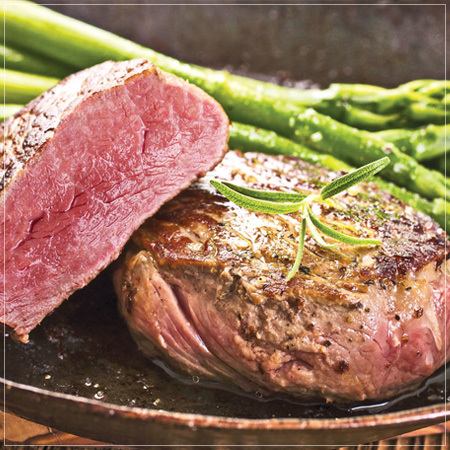 Place the rib-eye steaks on warmed plates with the brandy peppercorn sauce and adorn each with rösti wedges and five asparagus spears. Enjoy with a glass of Far Niente Cabernet Sauvignon.